The Levant Sparrowhawk (Accipiter brevipes) is a small bird of prey in the family Accipitridae which also includes many other diurnal raptors such as eagles, buzzards and harriers. It breeds in forests from Greece and the Balkans east to southern Russia. 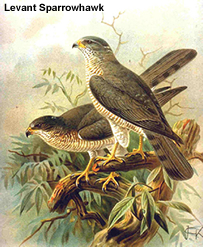 The Levant Sparrowhawk nests in trees, building a new nest, lined with green leaves, each year. The normal clutch is 3-5 egs. It hunts small birds, insects and lizards in woodland, relying on surprise as it flies from a perch to catch its prey unaware. This bird is a small raptor with short broad wings and a longish tail, both adaptations to manoeuvring through trees. 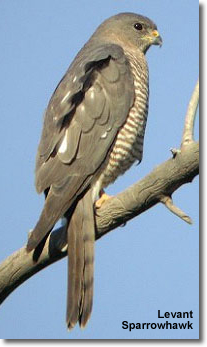 It is similar to the Sparrowhawk, but its shorter tail and more pointed wings give it a more falcon-like appearance. Levant Sparrowhawk is 30-37 cm long with a 63-76 cm wingspan. The female is larger than the male, but the difference is not as marked as with Sparrowhawk. The adult male is blue-grey above, with dark wingtips, and barred reddish below. The adult female is slate-grey above with darkish wingtips. She is barred reddish brown below, and may show a dark throat line. The juvenile is dark brown above and has dark-streaked underparts It shows a dark throat line. The flight of this hawk is a characteristic "flap – flap – glide". The call is a sharp "kee-wick".